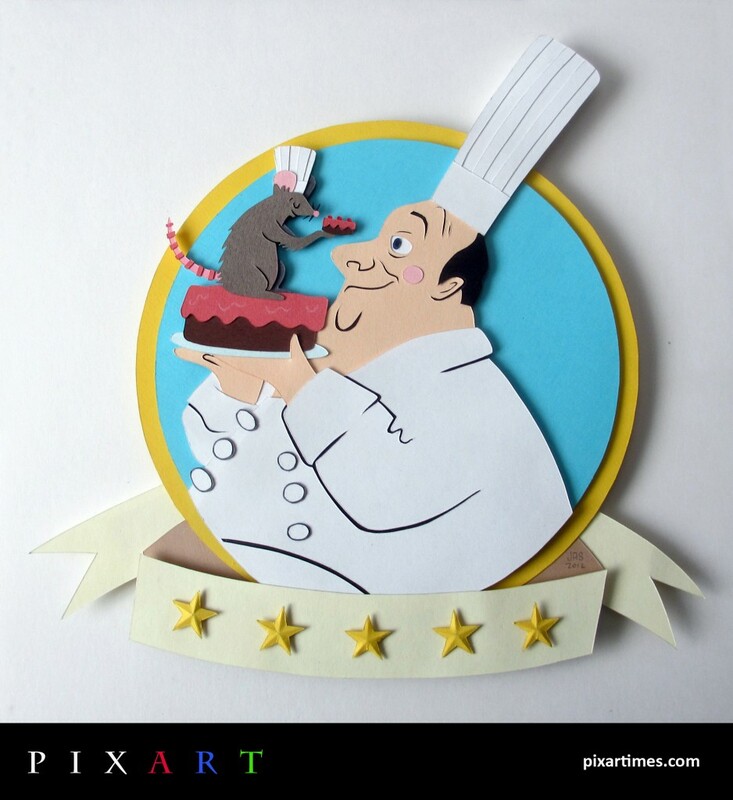 We are so thrilled to feature this wonderful Ratatouille themed piece from artist Jared Andrew Schorr. Specializing in intricate paper cut illustrations, Schorr has been featured in some impressive venues. His beautifully crafted images have been seen in The New Yorker, Gallery Nucleus and Disney’s WonderGround Gallery just to name a few. Schorr created a few pieces for the WonderGround Gallery including several Monsters Inc. pieces, a Wall-E piece and a Mickey Mouse piece. He was also featured as the Resident Artist for the month of August 2012 while showing in the WonderGround Gallery in the Downtown Disney District (Anaheim, CA). Every weekend of that month, guests were invited to watch Schorr in action – he created his paper cuts right there in the Gallery. While we’ve done our best to present this piece in photo form, you really have to see Schorr’s work in person to truly appreciate all the fine details that go into each piece. Read on for more about the artist in his own words! My Favorite Pixar Movie is… Monster’s Inc. I really love Ratatouille. I’ve seen it around 100 times and my favorite part is when Gusteau first talks to Remy. They start arguing and Remy says “Why am I talking to you? You’re just an illustration?! ?” It’s so funny and well acted and strikes a chord with me every time because I always catch myself talking to my own illustrations as I draw. I love the style of the illustration and wanted to draw the two characters together. The dreaded inspiration question!?!? I can’t say everything because it sounds lame so I’ll say fear. Website: gingerhaze.com/nimona – A great comic! Our thanks to Jared for this great contribution! If you’d like to be considered for a PixArt Feature, Contact us and include a link to your portfolio. View all the previous PixArt pieces we have featured here.